Over the past few days, there has been a lot of noise in the tech media about the supremacy of "profit share" over "market share", specifically related to Apple's performance in the smartphone market (but it can be extended to Samsung as well). Most proponents of this argument seem to fundamentally misunderstand the long-term relevance of the "profit share" metric. Let's make a more educated comparison between the two metrics to understand how each can be used to analyze the smartphone industry. Understanding "Market Share" & "Profit Share"
Certain segments of the tech media seem to be obsessed with the profit share vs. market share comparison, with some championing a "ratio of profits to market share" metric. Unfortunately, the two metrics are not necessarily comparable. Market share is a measure of how a limited pool of consumers buy (or own) products from various vendors or platforms. The key drivers of market share are, obviously, competition and pricing (i.e. price segmentation of consumer markets). Even if a market is growing, market share trends give you a fairly good understanding of the platform/OEM dynamics in the industry. Profit share is a comparison of profitability among a set of competing companies. While profit share is also driven by the competition & price segments, it is also affected by dynamics within a company's own supply chain. Having a high profit share does not necessarily mean that it was "taken" from competitors. It could also mean that it was "taken" from suppliers and/or distributors. This is especially true in the smartphone sector, where most mature market sales are subsidized by operators and supplier margins are squeezed by large OEMs. Since firms do not compete for a limited pool of profits, comparisons between market share and profit share are extremely difficult. Profit Share vs. Market Share: Which is More Relevant for the Mobile Industry? What ruined Apple was not growth … They got very greedy … Instead of following the original trajectory of the original vision, which was to make the thing an appliance and get this out there to as many people as possible … they went for profits. They made outlandish profits for about four years. What this cost them was their future. What they should have been doing is making rational profits and going for market share. As per this quote, circa 1995, Steve Jobs seems to think that market share is the more relevant metric to gauge long-term impact. But there's no reason for us to take this quote as gospel just because it came from Steve Jobs. Let's analyze his argument in detail. Historical industry patterns and disruption theory show us that as products improve and become "good enough" for mainstream use, it becomes more difficult to create a strong value proposition by making a "better" product. As this trend occurs, it becomes more and more difficult to maintain a premium over your competitor's products, product pricing becomes a bigger purchase consideration and brand value suffers. This is especially true in the technology industry, where the pace of product improvement is extremely rapid and seems to be getting faster with each new technology cycle. This would already be fairly clear to anyone tracking the technology industry, especially the smartphone industry. Five years ago, brands like Palm, Nokia, Blackberry and Motorola dominated the industry, but are now barely relevant compared to Apple & Samsung's dominance. Also, regional smartphone vendors like Huawei, Lenovo and ZTE have risen to prominence in emerging markets and are making inroads into key mature markets. As products become good enough, the software/services ecosystem evolves from being a differentiator to a hygiene factor, i.e. a necessary but not sufficient condition for a purchase. At that point, consumers expect a product to offer all the advantages offered by leading ecosystems and the lack of access to such an ecosystem becomes a significant entry barrier for an OEM (e.g. : Nokia's struggles with Windows Phone). This is why the platform that offers the lowest entry barriers to OEMs (combination of a strong applications/services ecosystem and low cost of entry) is the one that ends up dominating an industry. In other words, the easiest path to hardware commoditization is the path the industry generally evolves in. Therefore, it is the platform with the greatest market share that has the greatest long-term potential. Based on this, it would seem that Steve Jobs was right about the supremacy of market share, at least for platforms. While profit share and OEM/hardware market share are good metrics to judge the current state of a company or OEM, they are quite irrelevant to gauge the current health or long-term potential of a platform. 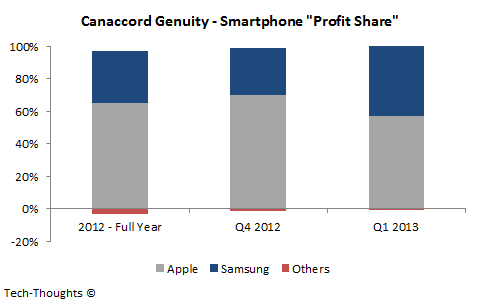 Profit share in the smartphone industry is currently skewed because of the economics involved. Smartphones sold in markets with higher purchasing power are mostly subsidized, which ensures that today's major brands dominate. Smartphones sold in markets with lower purchasing power are mostly unsubsidized, which ensures the dominance of low-end phones, and a number of low-end vendors (with far lower profits). This is has been the cause of the polarized profit share picture. But is this structure sustainable as the industry evolves? As smartphones become good enough for both consumers and carriers (there are signs that this may already be happening), purchasing patterns become more dependent on pricing and replacement purchases slow down. As price points drop, emerging market consumers will buy more cheap smartphones, while mature market carriers will attempt to benefit from improved product parity. Some carriers, like T-Mobile, may resist subsidies altogether (the economics in the US smartphone market make this a possibility), while others may attempt to push comparable smartphones with lower subsidy bills. This would benefit smartphone vendors with lower cost structures, i.e. today's low-end/regional vendors (Lenovo, Huawei, etc.). These low-end vendors could accelerate this process through acquisitions. Since Apple's pricing is static, its growth and volumes will begin to slow (this long-term trend may be even sharper in the tablet market as the price-demand relationship is more natural, without carrier-driven distortions). There is enough evidence of this already as Apple as struggled to add more operator partnerships at its current terms (including large carriers like China Mobile). Even a "low-end" iPhone may be too expensive to buck this trend. In the case of Samsung, they will be forced to lower prices or face lower volumes (already happening in India & China). As Apple & Samsung's market dominance is challenged, suppliers will have more potential customers and see greater bargaining power, which would further pressure OEM profit margins. Based on this, it is clear that a polarized profit share picture is a necessity during the early stages of an industry cycle. However, as products become good enough, pricing pressure and supplier bargaining power limits profits. This "profit share trap" becomes more problematic as investors & analysts continue to expect the same, unsustainable level of growth and profitability. The only way to escape this trap is by diversifying (IBM is an example), becoming a services/software/component supplier to the increasingly competitive OEM space (Samsung has the advantage here) or by the riskiest approach - attempting another disruption (Apple's rumored iWatch seems to be such an attempt).